Size: Between 1/8th and 1/5th of an inche or between 2mm and 5mm. Colour: Mealybugs bodies can be white to an off pink colour, they usually excrete a pinkish fluid when squashed. Transfer: Mealy Bugs find their way to other plants by hitching rides with humans or animals. Juvenile mealybugs can crawl from an infected plant to another plant. One of the most common pests to occur in succulent, amateur and enthusiast alike, collections. These pests can do severe damage to your plants if they are left unchecked. Mealybugs can be quite difficult to control as they have a waxy coating over their bodies and they tend to infest the more hard to reach areas of plants. Plants will seldom die of these pests due to heavy infestations being unsightly (you just can't miss it). Mealy bugs excrete a honeydew that attracts ants and possibly black sooty mould. The ants and the sooty mould do not do much damage but rather makes the plant look unsightly. 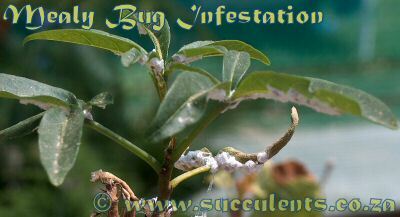 Mealy Bugs will kill off leaves and if left unchecked they will kill the plant. Mealy bugs also effect the development of flowers and stems (especially in succulents with fleshy stems). Biological control - Introduce Hypoaspis and/or Cryptolaemus (Australian Ladybird) to the infected plants. Hypoaspis is a small mite that feeds on small insects, especially mealy bug. Manual removal - You can pick the bugs off manually in plants that are not severely infested or use a strong jet of water (be careful not to damage plants). Manual Removal - Use a 50/50 mix of water and methylated spirits to wipe away the bugs, the spirits should kill any remaining pests.